Spearmint has the same properties as peppermint, but its effects are less powerful, and the taste milder and less hot, making it better suited for use in children. Use Spearmint tea to relieve the symptoms of colds, congestion or stomach upset and nausea. Spearmint tastes so good that it is good to drink even if you are feeling fine. Recipe Instructions: Herbal Tea :Use a teaspoon of dried, or a small handful of fresh leaves for each cup of tea. 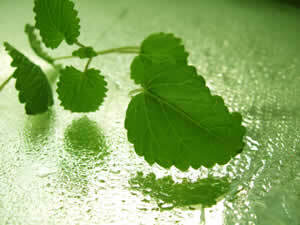 Spearmint is an easy mint to grow, and the fresh leaves make an attractive garnish, and can be muddled to add to drinks.